soundpromusic Music Licensing, International Services, Background Music, Film, Tv, Video games and Web Promos. 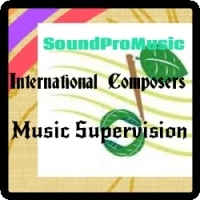 Our cataloge includes over 50 international composers. We pitch to tv, film, video games and background music. Receive demos directly to your account for free in a controlled and organised way to save you time and keep them away from your inbox. Whether you’re looking for the next big act to sign, new writers to publish or new songs for your sync library you’ll find it all on Music Gateway.